This time the Golden Goose will ride a magic carpet to deliver you to the Arabian Nights genie who has an immense treasure to share with you. 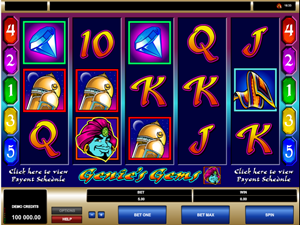 The Genie’s Gems is a five-reel slot machine in the Golden Goose series released by Microgaming. The slot features wilds, scatters, free spins and a fabulous Golden Goose bet feature enabling you to trigger one of four bonus rounds and get big cash wins, multipliers and other gainful goodies. 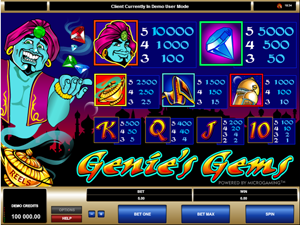 Genie’s Gems is a 5-reel 20-payline non-progressive slot which theme revolves around Oriental fairytales. The symbols you’ll see on the reels fit the theme perfectly and include a sword, a golden helmet, a flying carpet, a genie’s lamp and a blue gem. These are supplemented by high playing cards from 10 to Ace, all designed in an Oriental style. Playing card icons are of the lowest value in the slot paying out 1 to 250 coins, for 2, 3, 4 or 5 of a kind. The themed icons award more decent wins, with the top payout being 1500 coins for five Blue Gems symbols landed on an active payline. A coin size comes in a range of $0.01 to $0.20, and the number of coins per line is adjusted from 1 to 10 by clicking the Select Coins button. Overall, the floor and ceiling bets per spin are $0.2 and $40 respectively, which is probably not so much to suit a high-roller, but is perfect for a penny-slotter. As in other slots in the line-up, Genie’s Gems is equipped with a Golden Goose bet feature; this is a side bet giving you access to four bonuses. To stand the chance of triggering one of four bonus rounds, you need to wager a side bet of 5 to 50 coins per spin that is added to your main bet. The Golden Goose bet comes as an optional feature, so it’s up to you whether to increase your regular bet by an extra side bet, or not. If playing at max and choosing to place the Golden Goose bet, your total wager will be increased by 50 coins, totaling 250 coins per spin. The Genie symbol is a wild and a wild multiplier. It can substitute for other missing icons to finish a winning combo best online pokies. The Genie is so strong that if he completes a combination, your payout will be trebled. Five Genies hitting an active payline award the grand jackpot of 8000 coins. Four of a kind pay out the second jackpot worth 2000 coins. The Golden Ball symbol serves as a scatter. Should these three or more land in any spot across the reels, you get x5 to x400 times a total bet. For example, you have wagered the slot’s top bet of 200 coins. In case you hit 5 scatters, you’ll take away 400x200=80,000 coins! If you play with the Golden Goose bet feature activated, one of the four bonus features described below may be triggered after any spin. You cannot select which feature to trigger; a choice of a bonus game is made at random. Bonus #1. The goose invites you to pick one of five cards to reveal the number of free spins and a multiplier you’ll get after the feature. The top awards are 11 spins and a x6 multiplier. Bonus #2. The goose offers you to select a pile of money or a golden egg. Picking the former awards you up to 10,000 coins, while picking the latter gives you up to a mouth-watering 50 free spins with all wins tripled. Bonus #3. You’ll see a screen with five reels, with 15 golden eggs on them. Select one egg in each reel to reveal an instant cash prize. After picking five eggs, the bonus win will be added to your game balance. The total top prize amounts to 5000 coins. Bonus #4. In this bonus game you do nothing but watch the golden goose walking across the reels to award you a random prize of up to 2000 coins. Golden Goose: Genie’s Gems incorporates a plenty of basic and unique features such as wilds, wild multipliers, scatters, free spins and a superb Golden Goose bet triggering lucrative bonus rounds. Wagering max, you can seize 80,000 coins for five scatters, and 50 free games at a x3 multiplier in a bonus feature.